On Oct. 31, the Taliban-produced Voice of Jihad website (http://shahamat-english.com/) posted a 35-minute-long video chronicling a “coordinated attack against 6 enemy outposts in one day,” which the Taliban claimed had occurred in the hotly contested district of Kamdesh in Nuristan province. Portions of the video were previously released on related insurgent websites on Oct. 19. 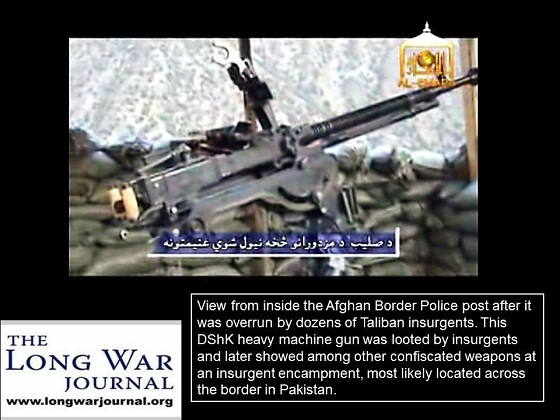 Independent analysis of the video conducted by The Long War Journal affirms that the location was most likely Kamdesh district, and that the video was probably filmed sometime during the summer months. 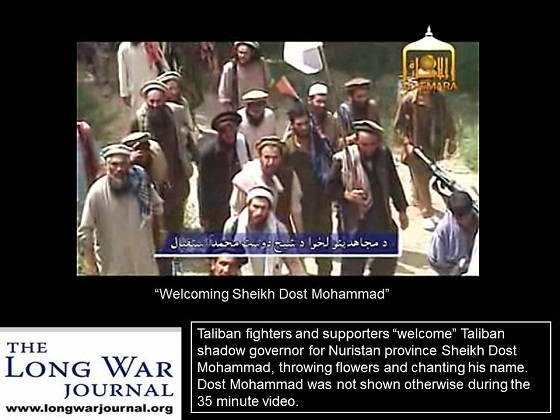 The video praises Sheikh Dost Mohammad, the Taliban shadow governor for Nuristan province, and shows a convoy and later a group of men being showered with flower petals, although Sheikh Dost Mohammad cannot be clearly seen in the footage. 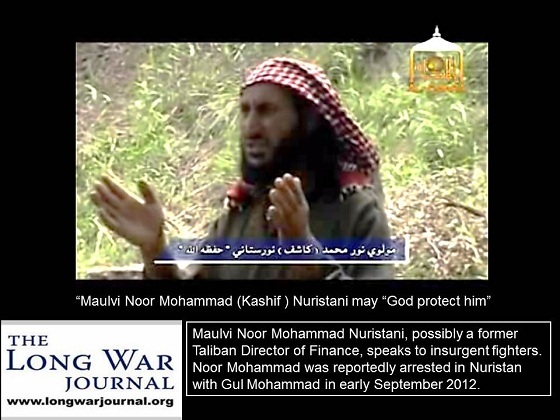 Interestingly, the video features sermons given by two suspected Taliban shadow officials for Nuristan, Maluvi Gul Mohammad, and Maluvi Noor Mohammad (Kashif ) Nuristani. Maluvi Gul Mohammad was a senior Taliban judge who operated in both Nuristan and Kunar provinces. He was reportedly arrested along with three Pakistani nationals during an Afghan security operation near Katinwa, which is located outside Nuristan’s provincial capital of Parun, in early September of this year. Maluvi Noor Mohammad, a Taliban financial chief, was possibly arrested during the same operation. Pajhwok Afghan News inferred that both Noor Mohammad and Gul Mohammad were “former” Taliban officials. 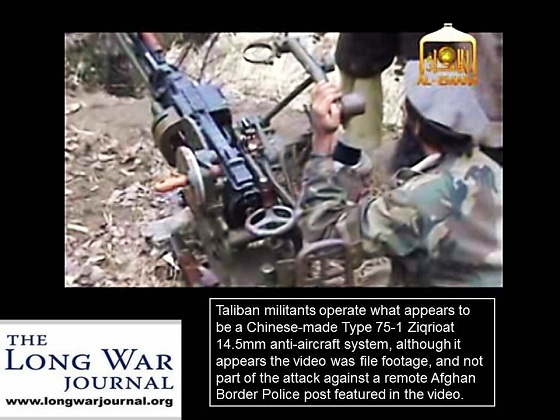 Nearly half of the video — a 15-minute segment — is dedicated to the depiction of a Taliban raid in broad daylight against a remote Afghan outpost manned by Afghan National Army and/or Afghan Border Police elements. 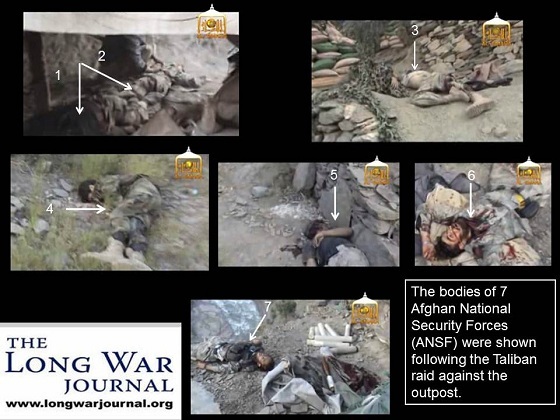 The video shows seven Afghan security personnel who had been killed defending their outpost, and Taliban insurgents are shown pillaging the outpost (and corpses) of weapons, ammunition, and clothing before Coalition aerial assets are seen bombing the hillsides nearby. 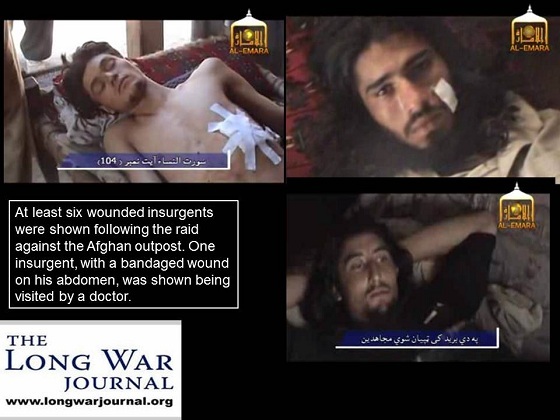 Several bandaged and apparently heavily medicated Taliban insurgents are later shown receiving medical treatment. The importance of weaponry is a theme that is reiterated throughout the video. 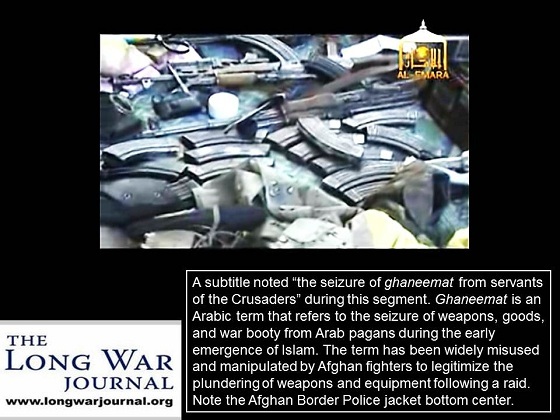 “The seizure of ghaneemat from the slaves [alternately servants] of Crusaders” is a subtitle that appears numerous times while images of apparently confiscated weapons, ammunition, and what appears to be Afghan Border Police uniforms, are shown. Ghaneemat is an Arabic term that loosely translates to “of which you gain,” a term that is also associated with the spoils of war taken from nonbelievers during the early days of Islam, while mal-e-ghaneemat is the more contemporary reference to “war booty.” Besides the seizure of weapons and ammunition, at least one Afghan government pickup truck can be seen being commandeered by insurgents, weakly camouflaged by fighters holding branches and foliage as they sit in the bed of the pickup. The weaponry theme is also highlighted by a short clip showing Afghan insurgents firing two heavy weapon systems — possibly a Type 75-1 14.5mm anti-aircraft system and a DShK machinegun — although it appears this footage was snatched from a previous Taliban video. The Type 75-1 system weighs approximately 214 kg (about 472 lbs.) and is considered a crew-served weapon system.